A few weeks ago I had the privilege of attending a conference on the theme Artists as Reconcilers. The event was put on by International Arts Movement www.iamny.org. In an age when diversity seems intent on bringing division the gaps are wide and often attended by fear and control. The biblical theme of reconciliation cuts across the grain of cultural realities and offers a hopeful perspective. What role art and the artist can play in fostering reconciliation is worth thinking about. Something of what needs to happen was expressed well in a line from W.H. Auden’s As I Walked out one Evening. Near the end of that poem he writes: “You must love your crooked neighbour with your crooked heart.” There is something leveling about this line, like the gospel it invites us to see that crookedness is not just the other person’s problem. Art can be put to reconciling work because unlike disposable entertainment it has the power to transform us. A little time spent with the news will serve to underline the claim that we seem to have lost touch with our full humanity. In addition to the often angry divisions among us there is the onslaught of technology which keeps us at one remove from others in the human community. I think it was Robert Frost who said that “poetry is a way of remembering what would impoverish us if we forget”. Art can and must be engaged to provide just such reminders –signs of hope, threads of order and resources for meaning – important work in a world where despair, chaos and an undercurrent of nihilism seem to find their way into so much that we do and touch our very identities. Art is capable of creating new conversations, conversations that will nudge us along to the restoration of shalom, conversations that will serve to dispel the darkness and replace our fears with a lyric of hope. To be sure art is capable of other things less desirable. Many contend that modernity holds freedom as its hallmark. The social expression of freedom is commonly found in transgression. The assumption is that boundaries hem us in while freedom keeps us from the stifling reality of the boundary – freedom preserves us from the “oppressive” limits that hold us back. If it is right to say that transgressiveness is a modern project then reconciliation is not a modern project, so argued theologian Miroslav Volf in his conference address. Reconciliation requires that we acknowledge boundaries. It is commonly said that art has nothing to do with religion – in fact this claim finds concrete expression in the art of the late 20th century. Why make such a claim. Well, it is argued, art is transgressive while religion is conservative and so they have no common ground. That art would affirm a transgressive stance and hold to the modern critique of boundary advocating instead freedom is a surprising move. I understand the appeal of freedom – the rugged individualist following personal preferences – but art in its very nature is a boundary sort of discipline. There is no art without line – whether a musical line, a dance line a poetic line or a painterly line. Makoto Fujimura the founding director of International Arts Movement told a story of a Zen Master he knew. He asked this Zen Master who his favourite artist was and the surprising reply was Georges Rouault. 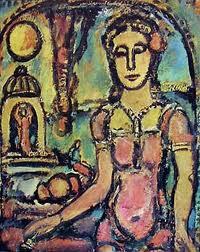 (Rouault was a deeply religious Catholic painter in the early 20th century). 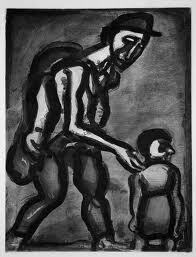 Why Rouault? was the response. The answer came, “His lines carry the weight of life”. There is in this perceptive response an important truth about boundaries. Somehow those lines which modern notions of freedom wants to erase are essential to human social and personal identity. Take them away and the result is an amorphous whole which is more likely to bring anxiety than comfort or hope. The great challenge to the Christian in our culture including the artist is to articulate boundaries which do not oppress or hem in but serve a liberating purpose and make reconciliation possible. Put another way art which is transgressive tears down – when what is needed is to build up. The creation story in Genesis clearly articulates acts of separation. What we need is a doctrine of creation which celebrates boundaries, boundaries tempered by the grace found in the story of redemption and the hope found in the ongoing work of the Spirit in the world.